The WMS420 wireless microphone system provides a highly flexible as well as easy to use solution. The ultra high frequency system is set up within seconds and is equally suitable on stage as well as in locations where a single- or multi channel solution is needed. The entire WMS420 wireless system consists of the SR420 stationary receiver, HT420 handheld transmitter and the PT420 pocket transmitter. The HT420 handheld transmitter is available with the patented D5 dynamic microphone acoustic. This capsule guarantees maximum rejection against feedback, reduced handling noise and the famous AKG sound. Both transmitters are shipped with charging contacts that enable the use of rechargeable batteries. Moreover the transmitters offer exceptional eight hours of operation time from a single AA size battery, which dramatically reduces the operating costs in day-to-day use. The detachable receiver antennas allow the use of professional accessories, such as antenna splitters and remote mounted directional antennas for multi channel systems. The WMS420 series includes three different bodypack sets. The head-worn set includes the high performance C555L condenser microphone. The presenter set includes the professional C417L lavalier microphone. The guitar set includes an instrument cable. 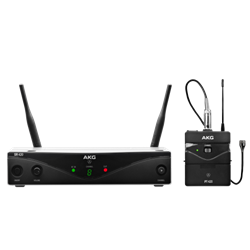 With the AKG WMS420 system up to eight channels can be run simultaneously.